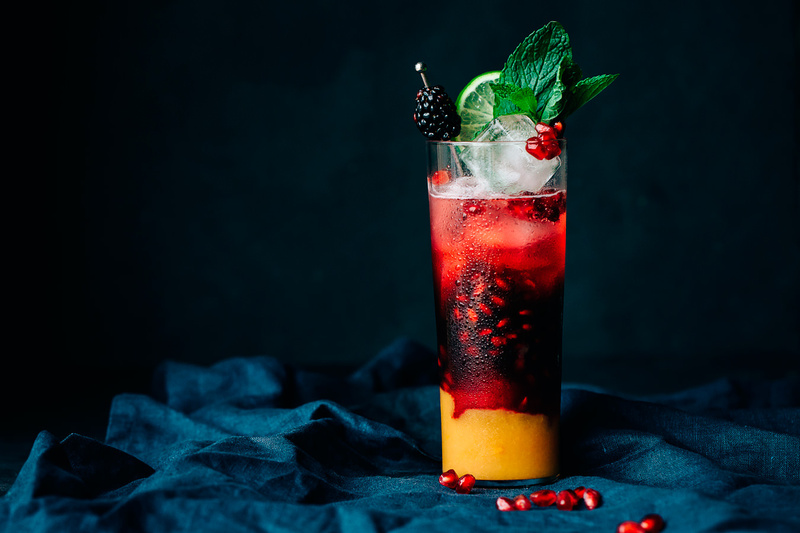 Canadian food blogger extraordinaire Gabriel Cabrera, of Artful Desperado, shares with us an on-trend, off-sugar, non-alcoholic cocktail to enliven sober January. I personally don’t believe in New Year’s resolutions. I think the magic of them lasts a month or two, and then we give up; mostly because the rules we lay out for ourselves are usually harsh and restrictive (a.k.a. not the way I want to live my life). However, I’m just fine with taking smaller steps towards improving overall health, particularly if those steps involve non-alcoholic cocktails. Despite the rise in popularity of craft cocktails, non-alcoholic cocktails, and other tonics or tinctures are becoming a huge trend in their own right, as more bartenders and party hosts realize that a) not everyone wants to get hammered, and b) those who abstain do not necessarily want to sit at the bar drinking plain soda water all night, either. This mighty non-alcoholic cocktail I present you provides the balanced beauty of a good fruity cocktail, minus the sugary hangover (by the way, I refer to it as a “non-alcoholic cocktail” because the word “mocktail” is so nineties I can see Saved by the Bell reruns in my head when I hear it). This drink has no added sugar, packs lots of flavour, and it can be made at home. I call it “The Mocker” (to mock the mocktail, get it?). Clever? Maybe. Delicious? Yes. Place the orange juice in a small pot. Let it simmer for 10-15 minutes until liquid reduces by half. Remove from stove and cool completely. Add the water to a small pot, bring to boil, and steep the tea. Let the tea simmer for about 10 minutes until liquid is reduced by half. Strain and cool completely. Fill a highball glass with ice and slowly pour the orange reduction so it sits at the bottom of the glass. Gently add the cold steeped tea and pomegranate seeds. Top with club soda. Squeeze a bit of lime, and add the lime slice, mint, and extra pomegranate seeds as garnish. This cocktail has no sugar added, but if you still want a bit of an extra sweet touch, use a teaspoon of agave syrup or honey. See more of NUVO’s cocktail recipes. Visit Gabriel Cabrera at Artful Desperado.